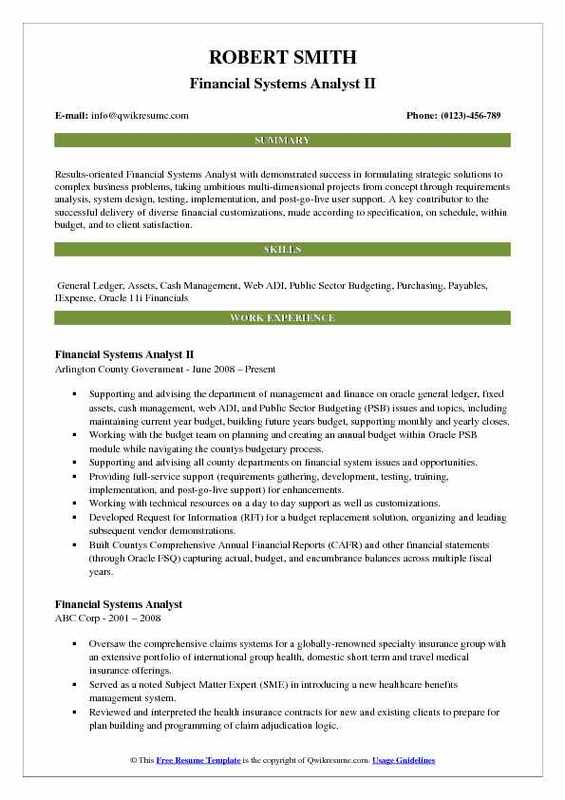 Responsibilities of a Financial Systems Analyst is to implement, maintain and update the financial system of the organization; Apart from supporting the financial systems, these professionals should be able to execute various other tasks like forecasting economical condition, troubleshoot financial issues and developing viable financial solutions. The other responsibilities that are carried upon by these analysts include importing and exporting files, training the employees regarding the use of financial systems and liaison between the management and the IT department. There is always a consistent demand for these professionals from diverse financial organizations such as banks, mutual funds, and various other industries. 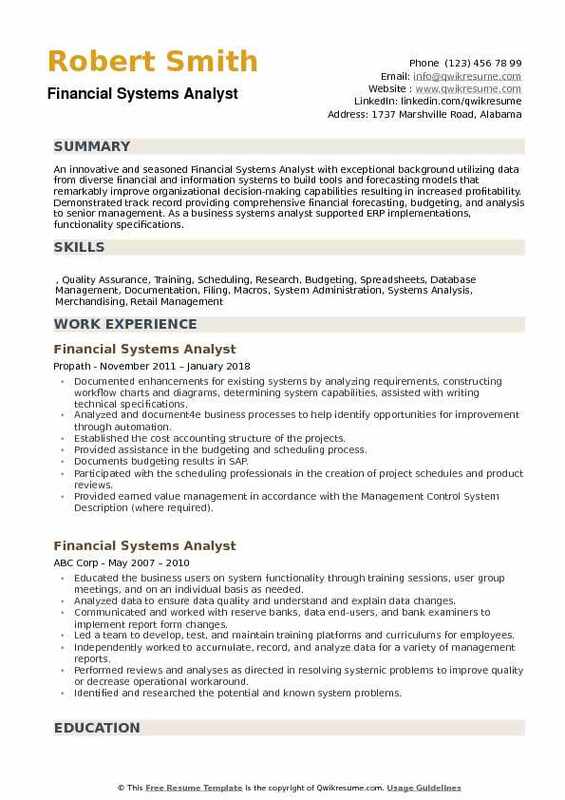 A Financial Systems Analyst Resume sample with a Bachelors degree in Finance or Economics or Accounting is mandatory to fill this position. A financial system analyst can also apply to various other related job postings like – Financial analyst, financial systems manager, and application systems analyst. 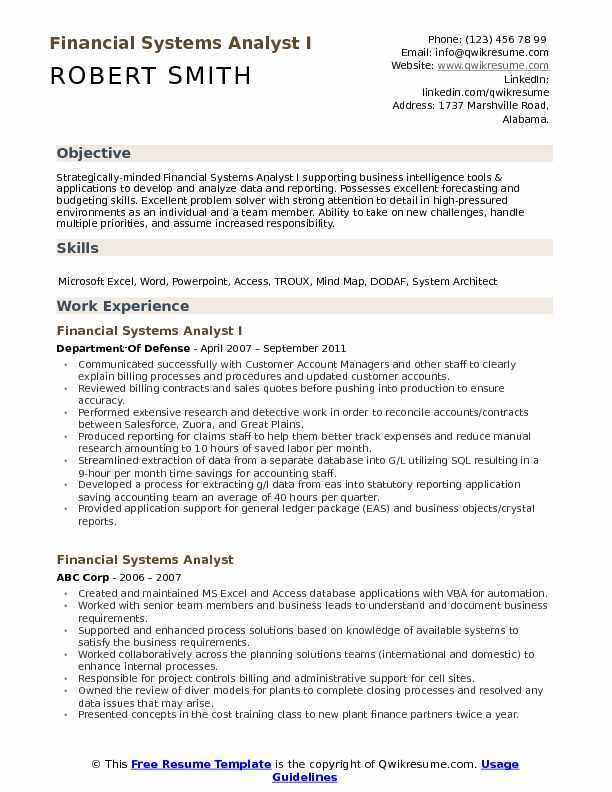 Summary : Strategically-minded Financial Systems Analyst I supporting business intelligence tools & applications to develop and analyze data and reporting. Possesses excellent forecasting and budgeting skills. Excellent problem solver with strong attention to detail in high-pressured environments as an individual and a team member. Ability to take on new challenges, handle multiple priorities, and assume increased responsibility. Communicated successfully with Customer Account Managers and other staff to clearly explain billing processes and procedures and updated customer accounts. Reviewed billing contracts and sales quotes before pushing into production to ensure accuracy. 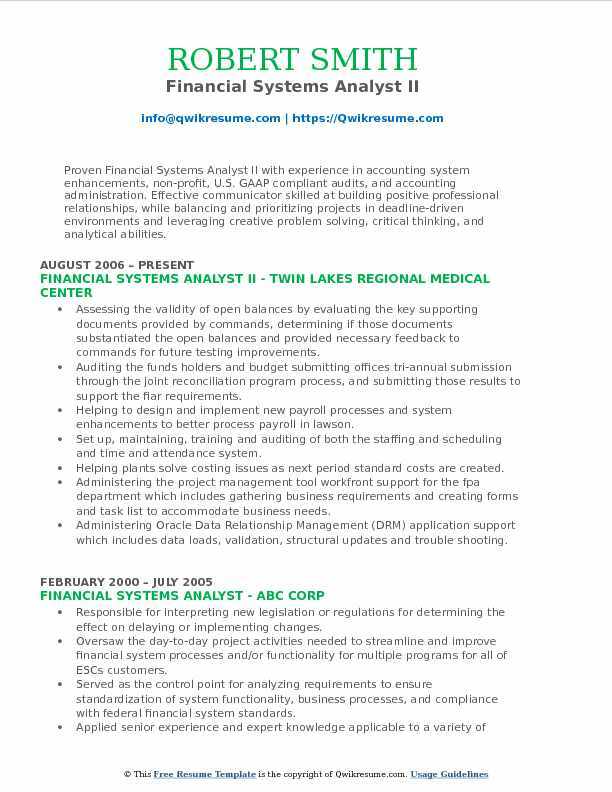 Performed extensive research and detective work in order to reconcile accounts/contracts between Salesforce, Zuora, and Great Plains. Produced reporting for claims staff to help them better track expenses and reduce manual research amounting to 10 hours of saved labor per month. Streamlined extraction of data from a separate database into G/L utilizing SQL resulting in a 9-hour per month time savings for accounting staff. Developed a process for extracting g/l data from eas into statutory reporting application saving accounting team an average of 40 hours per quarter. Provided application support for general ledger package (EAS) and business objects/crystal reports. Monitored daily batch system processes, provided all maintenance and security functions for g/l application, root-cause analysis, troubleshoot issues, and research discrepancies. Managed all aspects of upgrades/patches for EAS including testing, training, and pre/post-implementation support. Summary : Highly accomplished & successful Senior Financial Systems Analyst with a strong financial background and over 7 years experience in SAP. Progressively responsible duties gained over the course of a career based on exceptional analytical, computer, and organizational skills. Recognized as a hands-on, proactive troubleshooter who can rapidly identify business problems. Flexible work style that adapts quickly to changing work needs. Owned the AR Salesforce case queue in responding to internal and external requests regarding customer billing and account reconciliation. Establishing and implementing the appropriate risk mitigation and quality control when developing and testing solutions in a tightly-regulated financial services company. Performing data identification, data acquisition, data cleansing, data preparation, completeness testing, data loading. Administering, populating and reporting from Microsoft SQL Server, SAS Financial Management, Bancware Asset Liability Management and Axiom Profitability Financial Systems. Responsible for the production of all reporting outputs required within the finance department. Facilitating meetings, defining the new business rules and requirements and establishing the standard operating procedures. Reporting metrics on program execution and funding status for facilities program to higher headquarters on a daily, weekly, and monthly basis. Audit liaison between directorates and various federal audit agencies. 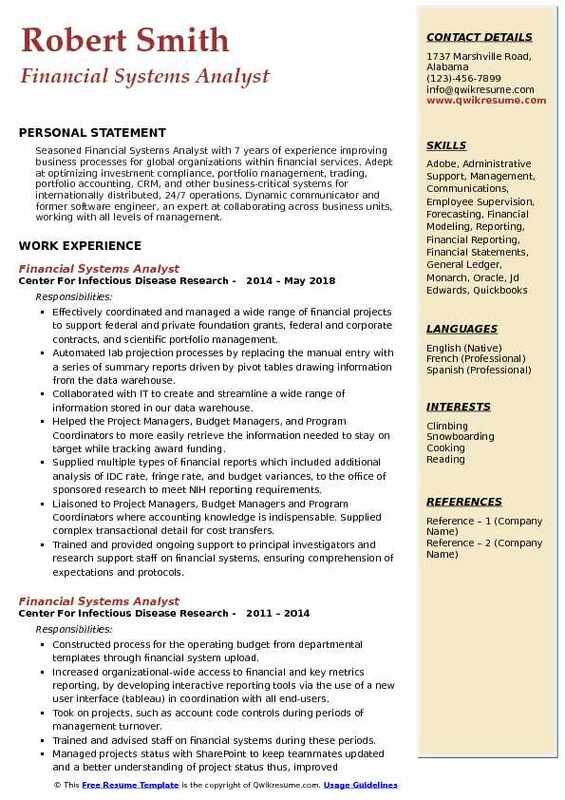 Summary : Results-oriented Financial Systems Analyst with demonstrated success in formulating strategic solutions to complex business problems, taking ambitious multi-dimensional projects from concept through requirements analysis, system design, testing, implementation, and post-go-live user support. A key contributor to the successful delivery of diverse financial customizations, made according to specification, on schedule, within budget, and to client satisfaction. Supporting and advising the department of management and finance on oracle general ledger, fixed assets, cash management, web ADI, and Public Sector Budgeting (PSB) issues and topics, including maintaining current year budget, building future years budget, supporting monthly and yearly closes. Working with the budget team on planning and creating an annual budget within Oracle PSB module while navigating the county's budgetary process. Supporting and advising all county departments on financial system issues and opportunities. Providing full-service support (requirements gathering, development, testing, training, implementation, and post-go-live support) for enhancements. Working with technical resources on a day to day support as well as customizations. Developed Request for Information (RFI) for a budget replacement solution, organizing and leading subsequent vendor demonstrations. Built County's Comprehensive Annual Financial Reports (CAFR) and other financial statements (through Oracle FSQ) capturing actual, budget, and encumbrance balances across multiple fiscal years. Stood up quality assurance management program, management internal control program to ensure the security of financial management operations. Conducted in-depth business process analysis and financial data mining. Developed requirements and applications to streamline processes and automate data analysis reducing manual input by 75%. Developed and managed 15+ access end-user and data integration database applications to automate financial data flow and accounting processes. Defined and validated the requirements, gathered financial data. Conducted analysis and studies utilizing budget statistical formulas, compared current and historical program data to prepare reports, forms, and schedules due to higher headquarters for the newly consolidated air force facilities sustainment, restoration, modernization, and demolition programs, totaling over $500m annually. Developed and automated daily and end-of-month financial reports and performance metrics. 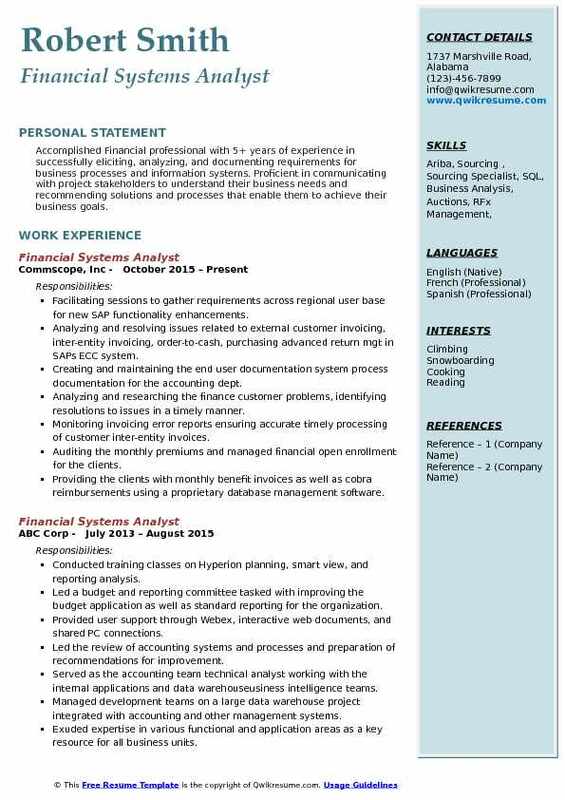 Headline : Accomplished Financial professional with 5+ years of experience in successfully eliciting, analyzing, and documenting requirements for business processes and information systems. Proficient in communicating with project stakeholders to understand their business needs and recommending solutions and processes that enable them to achieve their business goals. Facilitating sessions to gather requirements across regional user base for new SAP functionality enhancements. Analyzing and resolving issues related to external customer invoicing, inter-entity invoicing, order-to-cash, purchasing advanced return mgt in SAPs ECC system. Creating and maintaining the end user documentation system process documentation for the accounting dept. Analyzing and researching the finance customer problems, identifying resolutions to issues in a timely manner. Monitoring invoicing error reports ensuring accurate timely processing of customer inter-entity invoices. Auditing the monthly premiums and managed financial open enrollment for the clients. Providing the clients with monthly benefit invoices as well as cobra reimbursements using a proprietary database management software. Partnering with senior financial systems analyst to determine the cause of any issues within the Lawson HR/Payroll system and determine a course of action to correct them. 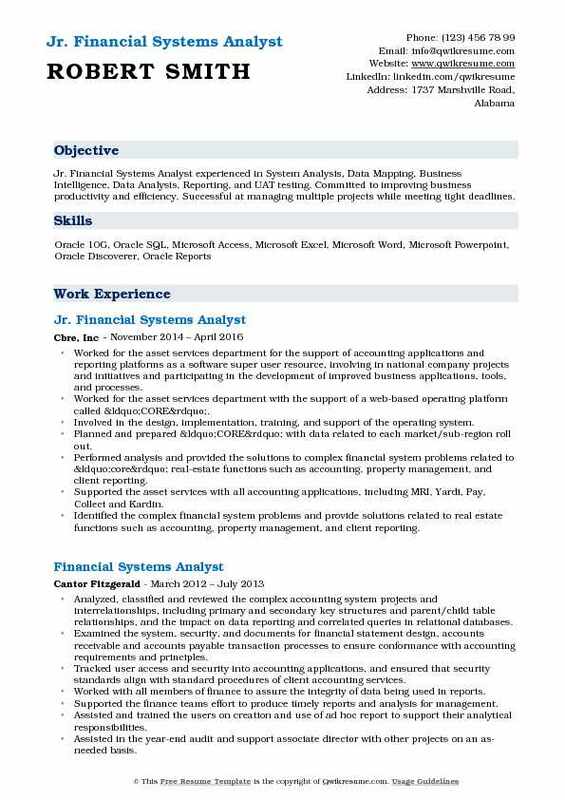 Objective : Jr. Financial Systems Analyst experienced in System Analysis, Data Mapping, Business Intelligence, Data Analysis, Reporting, and UAT testing. Committed to improving business productivity and efficiency. Successful at managing multiple projects while meeting tight deadlines. Worked for the asset services department for the support of accounting applications and reporting platforms as a software super user resource, involving in national company projects and initiatives and participating in the development of improved business applications, tools, and processes. Worked for the asset services department with the support of a web-based operating platform called “CORE”. Involved in the design, implementation, training, and support of the operating system. Planned and prepared “CORE” with data related to each market/sub-region roll out. Performed analysis and provided the solutions to complex financial system problems related to “core” real-estate functions such as accounting, property management, and client reporting. Supported the asset services with all accounting applications, including MRI, Yardi, Pay, Collect and Kardin. Identified the complex financial system problems and provide solutions related to real estate functions such as accounting, property management, and client reporting. Summary : Proven Financial Systems Analyst II with experience in accounting system enhancements, non-profit, U.S. GAAP compliant audits, and accounting administration. Effective communicator skilled at building positive professional relationships, while balancing and prioritizing projects in deadline-driven environments and leveraging creative problem solving, critical thinking, and analytical abilities. Assessing the validity of open balances by evaluating the key supporting documents provided by commands, determining if those documents substantiated the open balances and provided necessary feedback to commands for future testing improvements. Auditing the fund's holders and budget submitting offices tri-annual submission through the joint reconciliation program process, and submitting those results to support the fiar requirements. Helping to design and implement new payroll processes and system enhancements to better process payroll in lawson. Set up, maintaining, training and auditing of both the staffing and scheduling and time and attendance system. Helping plants solve costing issues as next period standard costs are created. Administering the project management tool workfront support for the fpa department which includes gathering business requirements and creating forms and task list to accommodate business needs. Administering Oracle Data Relationship Management (DRM) application support which includes data loads, validation, structural updates and trouble shooting. Completed over hundred new set-ups on time and accurately, including new deals, investments, properties and companies. 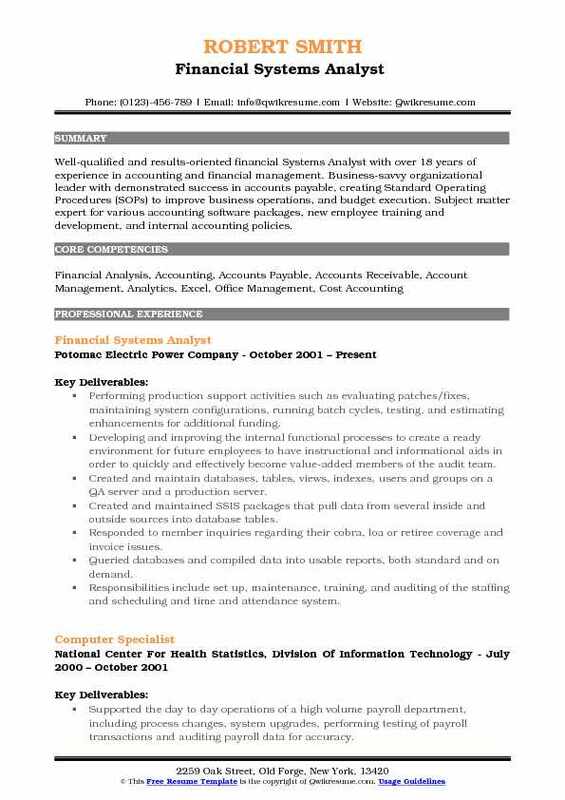 Summary : Well-qualified and results-oriented financial Systems Analyst with over 18 years of experience in accounting and financial management. Business-savvy organizational leader with demonstrated success in accounts payable, creating Standard Operating Procedures (SOPs) to improve business operations, and budget execution. Subject matter expert for various accounting software packages, new employee training and development, and internal accounting policies. Performing production support activities such as evaluating patches/fixes, maintaining system configurations, running batch cycles, testing, and estimating enhancements for additional funding. Developing and improving the internal functional processes to create a ready environment for future employees to have instructional and informational aids in order to quickly and effectively become value-added members of the audit team. Created and maintain databases, tables, views, indexes, users and groups on a QA server and a production server. Created and maintained SSIS packages that pull data from several inside and outside sources into database tables. Responded to member inquiries regarding their cobra, loa or retiree coverage and invoice issues. Queried databases and compiled data into usable reports, both standard and on demand. Responsibilities include set up, maintenance, training, and auditing of the staffing and scheduling and time and attendance system. 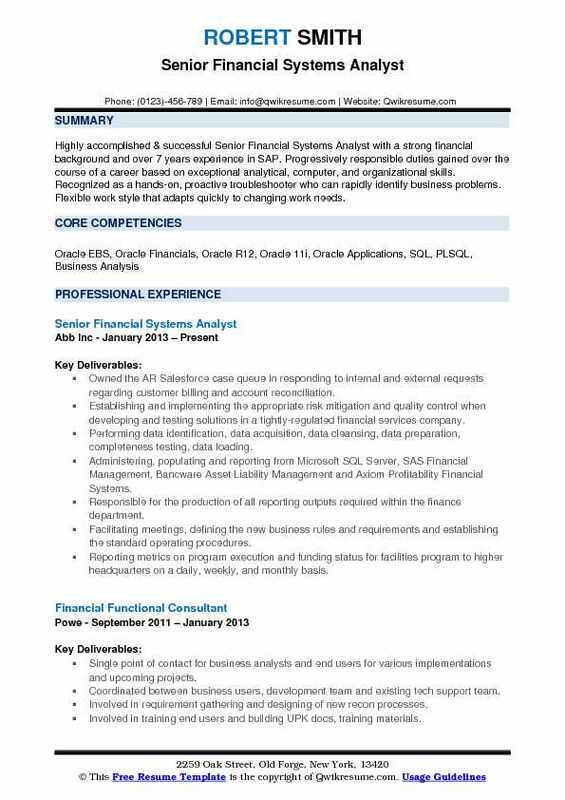 Summary : Seasoned Financial Systems Analyst with 7 years of experience improving business processes for global organizations within financial services. Adept at optimizing investment compliance, portfolio management, trading, portfolio accounting, CRM, and other business-critical systems for internationally distributed, 24/7 operations. Dynamic communicator and former software engineer, an expert at collaborating across business units, working with all levels of management. Effectively coordinated and managed a wide range of financial projects to support federal and private foundation grants, federal and corporate contracts, and scientific portfolio management. Automated lab projection processes by replacing the manual entry with a series of summary reports driven by pivot tables drawing information from the data warehouse. Collaborated with IT to create and streamline a wide range of information stored in our data warehouse. Helped the Project Managers, Budget Managers, and Program Coordinators to more easily retrieve the information needed to stay on target while tracking award funding. Supplied multiple types of financial reports which included additional analysis of IDC rate, fringe rate, and budget variances, to the office of sponsored research to meet NIH reporting requirements. Liaisoned to Project Managers, Budget Managers and Program Coordinators where accounting knowledge is indispensable. Supplied complex transactional detail for cost transfers. Trained and provided ongoing support to principal investigators and research support staff on financial systems, ensuring comprehension of expectations and protocols. 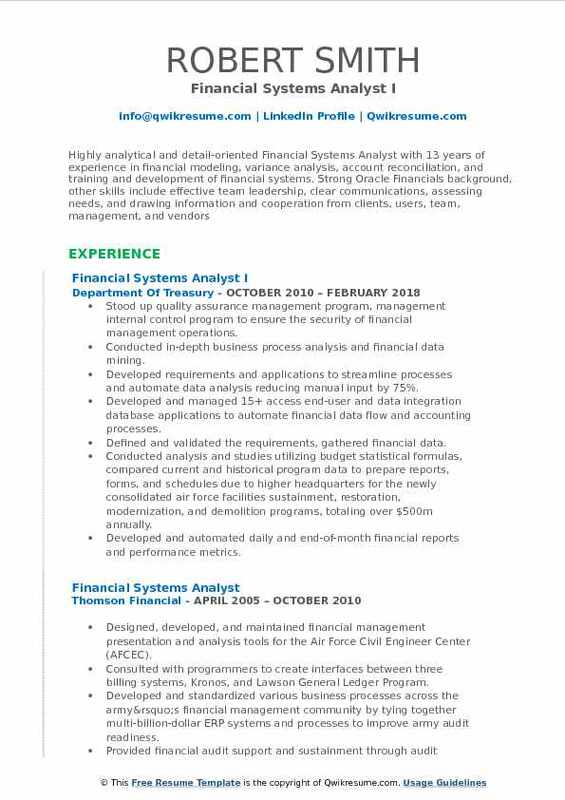 Summary : An innovative and seasoned Financial Systems Analyst with exceptional background utilizing data from diverse financial and information systems to build tools and forecasting models that remarkably improve organizational decision-making capabilities resulting in increased profitability. Demonstrated track record providing comprehensive financial forecasting, budgeting, and analysis to senior management. As a business systems analyst supported ERP implementations, functionality specifications. Documented enhancements for existing systems by analyzing requirements, constructing workflow charts and diagrams, determining system capabilities, assisted with writing technical specifications. Analyzed and document4e business processes to help identify opportunities for improvement through automation. Established the cost accounting structure of the projects. Provided assistance in the budgeting and scheduling process. Documents budgeting results in SAP. Participated with the scheduling professionals in the creation of project schedules and product reviews. Provided earned value management in accordance with the Management Control System Description (where required). Monitored costs to ensure accurate accounting. Facilitated cost corrections and/or prepares account correction documents. Provided the end-user application support for all ERP and related applications. This included troubleshooting errors, coordinating with vendors, managing support tickets, training and testing solutions.